Aura Diamonds is your go-to diamond and custom engagement ring designer in Dallas, Tx. Our specialty is not only providing clients with beautiful diamond and diamond jewelry pieces, but ensuring you understand what makes your personal diamond great! We want to empower you to understand your diamond selection and the entire diamond engagement ring shopping process! The most popular purchase among our clients are our diamond engagement rings available both online and in person at our Dallas location. 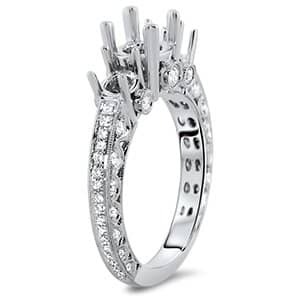 Whatever engagement ring type you’re looking for we have it! From modern on-trend engagement rings, custom made engagement rings, to classic vintage engagement rings. We’re your one stop go-to Dallas engagement ring store! Our priority is making your Dallas diamond ring dreams come true! Have a question? Don’t be shy! Get in touch with one our jewelry designers today! Have you dreamed of designing your own ring? 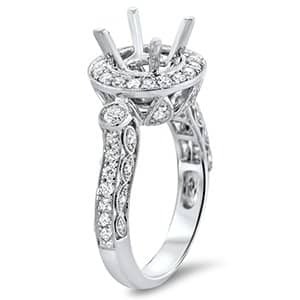 What Types of Engagement Rings in Dallas Do We Offer at Aura Diamonds? 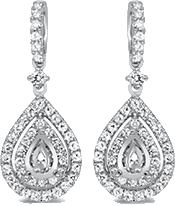 Aura Diamonds Dallas is a diamond wholesale dealer. Unlike traditional jewelry stores who purchase their stock from other vendors we host our own vast inventory of diamonds. Shopping with us means finding the engagement ring of your dreams whether its an antique engagement ring, vintage engagement ring, classic engagement ring, or even your very own custom unique engagement ring! Shopping with Aura Diamonds ensures you have access to the widest variety of Dallas engagement rings possible. We understand every couple wants their engagement ring to be just as unique as their love and relationship. We strive to provide variety and quality that fits your personal taste, budget, and lifestyle. With every style, cut, and color available in our inventory the sky is really the limit when you shop for engagement rings Dallas with Aura Diamonds! 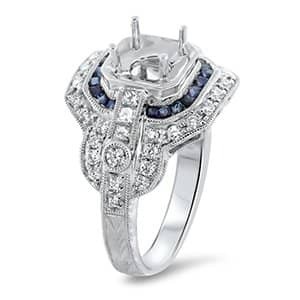 If you can imagine it our expert jewelry designers can bring it to life! We love designing custom engagement rings in Dallas! What’s the Most Popular Type of Engagement Ring in Dallas? Every couple and every engagement ring are different, but when you’re in the business as long as us you pick up on trends. 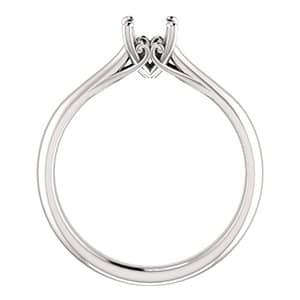 When shopping for engagement rings for women the current most popular style is the halo engagement ring. With a brilliant center diamond and a literal halo of smaller stones surrounding it the halo style engagement ring displays your happy relationship status with brilliance, class, and flair. 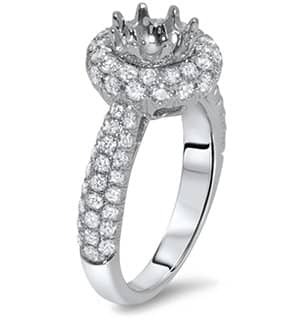 Wearing a halo diamond engagement ring will make any woman feel like the queen of happiness and romance. 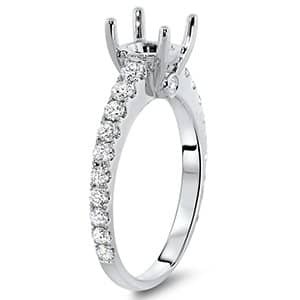 Many couples choose the halo style engagement ring, because it allows for a smaller (but still brilliant) center diamond. The halo of small stones reflect light and brilliance from every angle ensuring a fiery diamond appearance for their engagement ring. If you’re not into the design of the halo engagement ring- don’t worry! 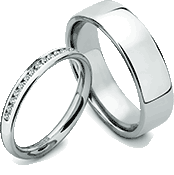 Aura Diamonds offers a wide inventory of styles and designs. Our diamonds are cut only by the finest crafters into the shapes our clients love. From the classic round to the emerald cut or cushion cut (and everything in between) you’ll find it at your Dallas engagement ring wholesale store, Aura Diamonds! How to Buy the Perfect Engagement Ring in Dallas? Shopping for an dallas engagement ring doesn’t have to be an overwhelming experience. Our in jewelry store and online experts are here to help! We offer a special course just for our clients to help you understand the traits of a signature diamond. The first step in engagement ring shopping is understanding your budget. 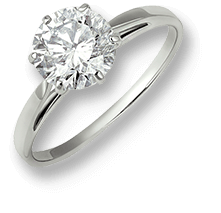 Aura Diamonds are proud to provide engagement rings for all budgets. Knowing your budget is an important step in the process, because going over budget and finding yourself in a bind isn’t romantic at all. Your diamond engagement ring should change your life for the better not for the worse! Brilliant and beautiful engagement rings can be found in any budget if you do your research first. To buy the perfect engagement ring in Dallas you need to understand the 4Cs of diamonds: Cut, Clarity, Carat, and Color. Each of these traits will play a big part in both the diamond engagement ring you purchase, and the price tag attached. Most Dallas engagement ring shoppers begin their diamond engagement ring shopping experience by browsing and researching online. Understanding the 4Cs is just the beginning. From there you need to decide which metal you’d like the band to be, which setting style you want for your diamond engagement ring, the shape of the diamond (and how many diamonds) you want for your engagement ring, and much more. We understand that shopping for a diamond engagement ring can feel like climbing a mountain, but it doesn’t have to. Here at Aura Diamond we strive to make the experience customized for each client and a fun and easy experience. To make your Dallas engagement ring shopping experience smooth focus on one particular aspect of your engagement ring first. What’s the most important aspect to you and your special someone? Is it the band’s metal? The setting? The diamond(s) itself? Choose the most important aspect for your Dallas engagement ring dreams and start there. Not only will it narrow down your choices, but it will also give you an idea of what you’re looking for. Still confused? Come talk to us at our engagement ring store in Dallas. We’re happy to walk you through the process. Have a Dream Dallas Engagement Ring Design in Mind, but Can’t Find a Ring to Match? Come talk to us! Let our jewelry designers answer your questions and begin the process of bringing your custom engagement ring to life! Our engagement ring design experts here in Dallas are here to help! Custom engagement ring Dallas are their specialty and they’ll happily include you in the creative process of creating the custom engagement ring of your dreams. Don’t settle for anything less than the best Dallas engagement ring to pop the question of a lifetime with. Come on in and let our designers help you bring the engagement ring of her dreams into reality! Few things determine your prefect diamond ring. 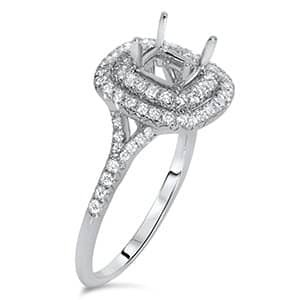 Aura Diamonds is your diamond and engagement ring wholesale dealer of Dallas.